A client that designs and fabricates a variety of electrical power distribution systems asked us to perform a thermal analysis of their 400-ampere busway. A three-dimensional model of the 400-Amps Track Busway system was constructed. This model consisted of about 300,000 three-dimensional solid electrical and thermal elements. Electrical and thermal contact elements were used between component surfaces that are either in contact or close to each other. Electrical and thermal conductivities were assigned to these contact elements to simulate the flow of electricity and heat between the surfaces. The connector body keeper, phase/neutral/ground connector bodies, phase/ neutral/ground busbar retainers, and phase/neutral/ground blade holder were eliminated in the solution phase since they had a minimal effect on the overall analysis results. 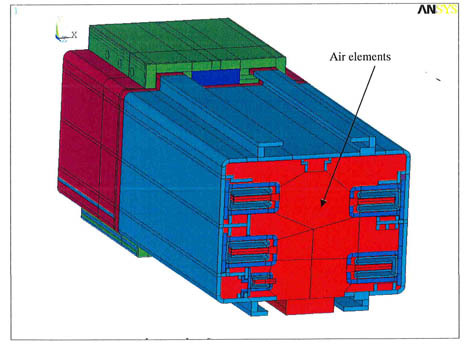 Components of the coupling joint contributing to the flow of heat and electricity namely M-shaped phase busbars, M-shaped neutral busbar, M-shaped ground busbar, insulators, housing, housing couplers, and phase blades were included in the model for analysis. Air between various components was simulated by elements having thermal properties of air.